You need to try this Creamy Butternut Squash Sauce! Butternut squash is so versatile. True to it’s name, it is rich and buttery in texture. It’s also super easy to hide it in recipes for those kids who don’t like veggies. This Creamy Butternut Squash Sauce is the bomb. I plan using it in a few upcoming recipes. Great with pasta, or use a dip for veggies. If you love squash, you will also love my Squash Soup with Caramelized Onions or my Gluten Free Squash Bread. This creamy sauce is made with absolutely no dairy. You would never guess the secret ingredient is cashews. This sauce is vegan, gluten free and paleo approved. 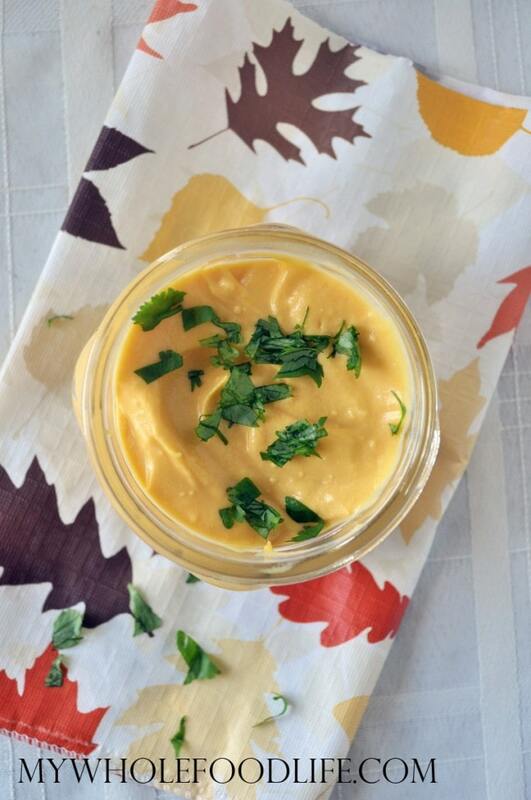 A creamy, dairy free sauce recipe! Drain the water from the soaked cashews. This should keep at least 5 days in the fridge. It can also be frozen. Enjoy! I really enjoy all your posts and recipes! I can't wait to try this one. I'm currently in the market for a blender and would love to know what you're using to get your sauce so smooth and creamy looking. Thank you for all the great real food recipes! thanks for your input. One more question...Do you think the tamper is important?....or because of the wider pitcher, you find it isn't needed. WOW! What a gorgeous looking sauce! I love the wonders of cashews. I also have many creamy delicious vegan recipes using cashews. I never thought of adding butternut squash though, what a gorgeous colour. Bookmarking! This looks so yummy and simple, I bet the cashews make this nice and rich! I'll have to try something like this instead of the usual tomato sauce thing. This looks so yummy! Can I use raw cashew nut butter instead of soaking and blending the cashews and if so, how much cashew butter do you think? Thanks! This sauce is wonderful. I added nutritional yeast and made the casserole. So good! I have an abundance of butternut squash and wonder if you think this sauce can be frozen.